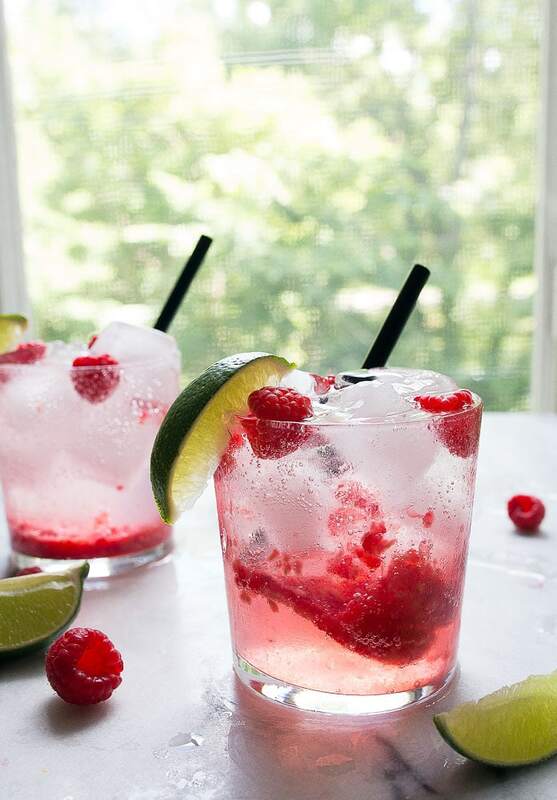 Fresh Raspberry Limeade for two. The best thing on a hot day! This post was sponsored by 7UP®; all opinions are my own. Must be 21 to consume alcohol. Drink responsibly. I want to share a glimpse into my life lately…the life that is selling a house, buying another one out-of-state, raising a kid, and running a business. (Spoiler alert: it’s CRAY). Last weekend, my husband and I bought, installed, and returned 2 air conditioner units. If that sounds like a lot of work, IT IS. We have a finished attic space at the top of our tiny little 1920s bungalow house. I use it as my photography studio (yes, everything you see photographed here or in my cookbooks was photographed up there). When we bought the house, we didn’t exactly notice that the upstairs wasn’t connected to central heat or air. Facepalm. Repeat. But, to be honest, it hasn’t really bothered us much. Sure, there are a few weeks out of the year where you absolutely cannot go up there because it’s 95+ degrees. And oh, let’s talk about the bats that moved into the roof last year (we had them safely and humanely removed for the very low price of $2k); yikes. Anyway, our house was on the market for about 4 days before the complaints started flowing that ‘it was too damn hot upstairs.’ So. We went and bought a window AC unit. We unpacked it, put it together, team-lifted it into place…only to discover it wouldn’t fit thanks to the charming window shape most commonly found in old homes. So. We packed it up and returned it. Then, we bought one of those stand-alone units that only vents out through the window. We felt really smart. We thought it would surely work. Twenty four hours later, on the hottest day of the year, we admitted defeat. We needed a professional air conditioner installed. So. We packed it up and returned it. Our second AC unit in 48 hours. In those grueling 48 hours, I introduced my husband to Sonic Drive-In. Please forgive my LA husband for not knowing about the greatness that is Sonic. I quickly schooled him on the custom drink options (I blew his mind with cherry vanilla soda), cream pie shakes, concretes, and most importantly: the limeade. Absolutely nothing tastes better than a limeade on a hot day. Especially if you spent most of the day packing and unpacking air conditioner units. Ok, I’ll stop complaining now. Brian admitted that the limeade is truly something special, and I decided it would be our ‘drink of the summer.’ While Sonic has cherry limeades and strawberry limeades, we ventured into the unknown: FRESH RASPBERRY LIMEADE. 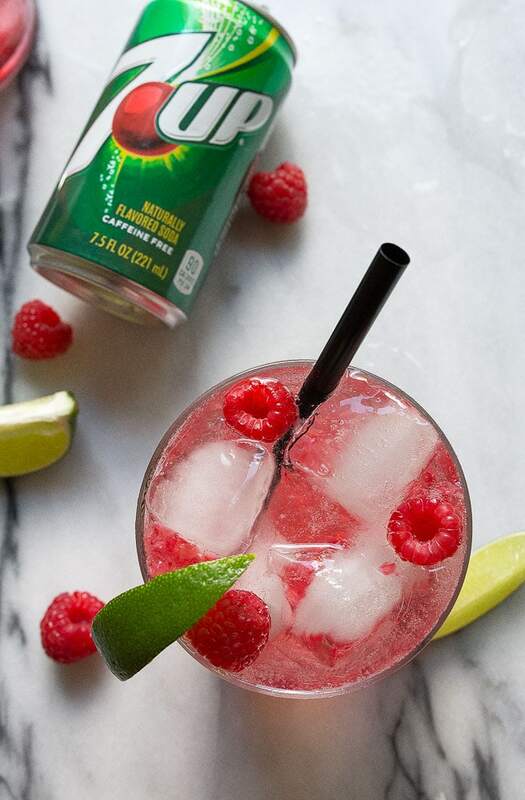 I grabbed a pack of 7UP® from Target (Camille loves to come along on a Target run), a double pack of fresh raspberries, and limes. Oh, and some booze. Because if we’re going to make the best limeade ever, it’s going to have some booze in it, for goodness sake! Oh, and speaking of Target, the cartwheel app has a new coupon every week this month for 7UP! This week, it’s for 2L bottles!! Make yourself a couple of these fresh raspberry limeades next time it’s hot outside. Or, next time you buy and return 2…okay okay, I’ll stop. Happy Summer! 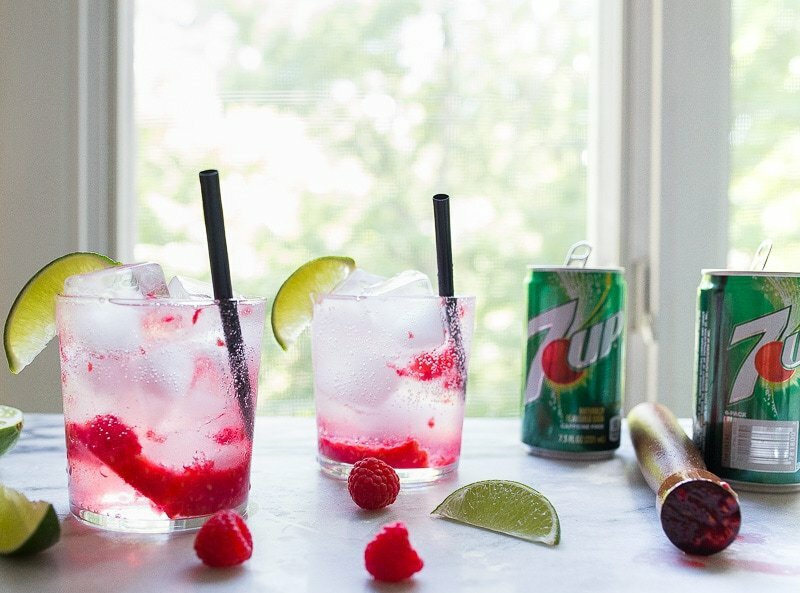 Follow this link to see more easy summer recipe ideas using 7UP! 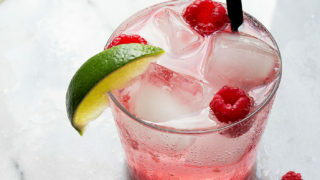 Fresh raspberry limeade for two with vodka or rum for fun! In the bottom of two serving glasses, add 6 raspberries to each glass. Smash the raspberries using a muddler or a wooden spoon. Smash them very well to release all of their juices. Squeeze a lime into each glass, and then divide the 7UP between the glasses. Add a shot of vodka to each glass, if you like. 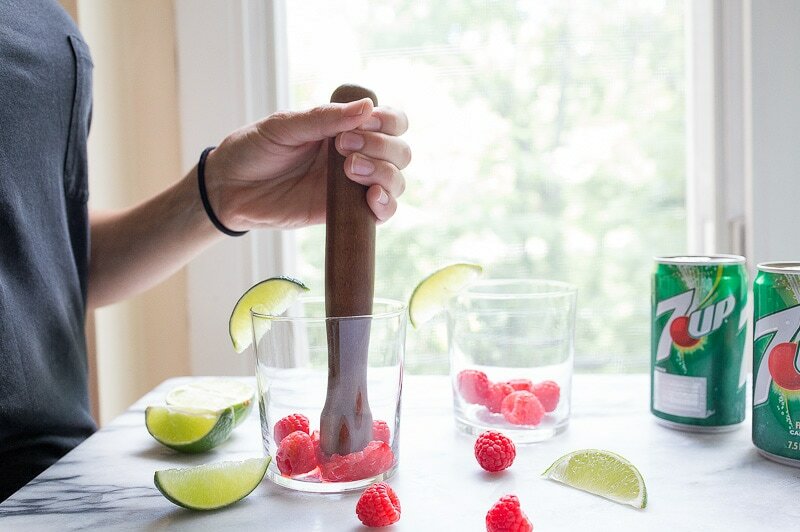 Garnish with a lime wedge and more raspberries, and serve. Try it with whipped cream vodka sometime. Weirdly good. In fact, whipped cream vodka in berry flavored lemonaide is amazing as well. Thanks for the great drink recipe! During the summer of 1961 – when I had just graduated from high school – I had a job at a busy lunch counter shop in downtown Boston (behind Jordan Marsh for those who might be interested or who know old Boston) and one of the specialties of the house was called a Lime Rickey. You smushed some ice chips into a tall, pretty, frosted glass, then you squirted some raspberry syrup from the fountain into the glass, and then squeezed a lime (in the metal squeezer) into the glass and filled the glass with seltzer from the fountain. And gave it all a stir with a long spoon. NOW you’re talking REFRESHING! Never had anything better than that!!! Lime Rickey. No alcohol. Enjoy!! This is just what I need. And obviously you needed it after all that hard work on the air conditioners! 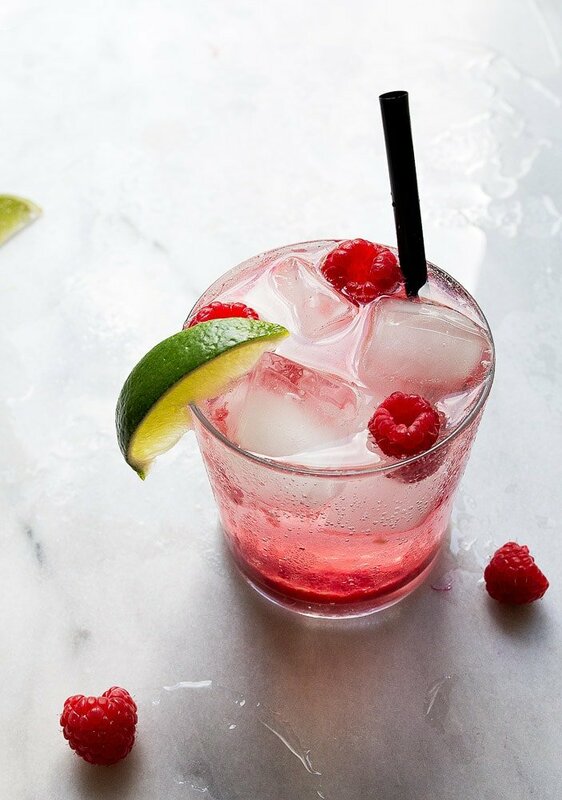 I love the idea of fresh raspberries in this drink. My favorite.